It is so much fun to travel, and to take a break from reality. It feels wonderful to get away from it all, and just feel the freedom that you may not be able to feel at home. Well, along with traveling comes packing, and depending on the type of trip you are taking, it could be difficult to figure out what to pack. 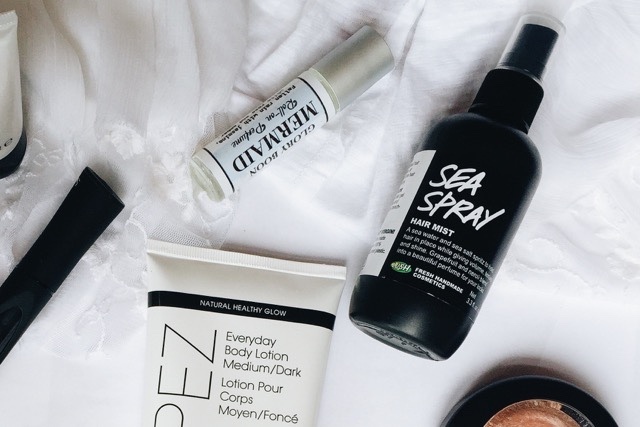 Luckily, my blogging gal pal, Rachel from One Pot Slop, and I have compiled some must-have travel essentials that will work for any type of trip. We each picked out a few items that are perfect for travel, and we had a lot of fun creating this post together. Hey everyone! I'm Rachel and I write the style blog One Pot Slop. 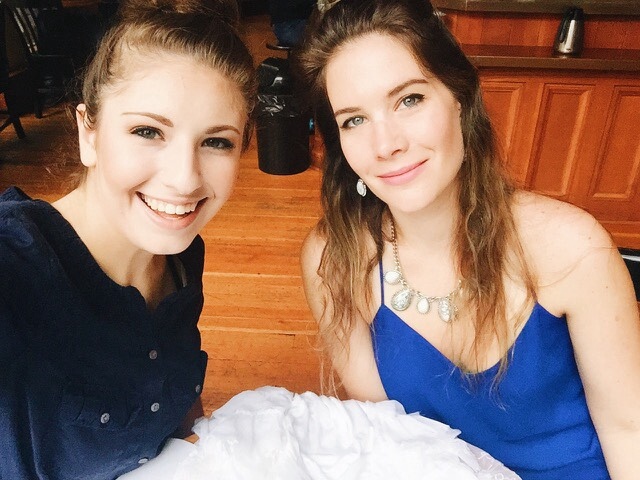 I'm so excited I got to partner with Courtney and bring you all this beauty post for travel! I'm in the midst of curating my list for a trip to the Bahamas next month and I can tell you every item here is essential. I hope this post is helpful and if you enjoy it come say hi on OPS I'd love to hear from you! 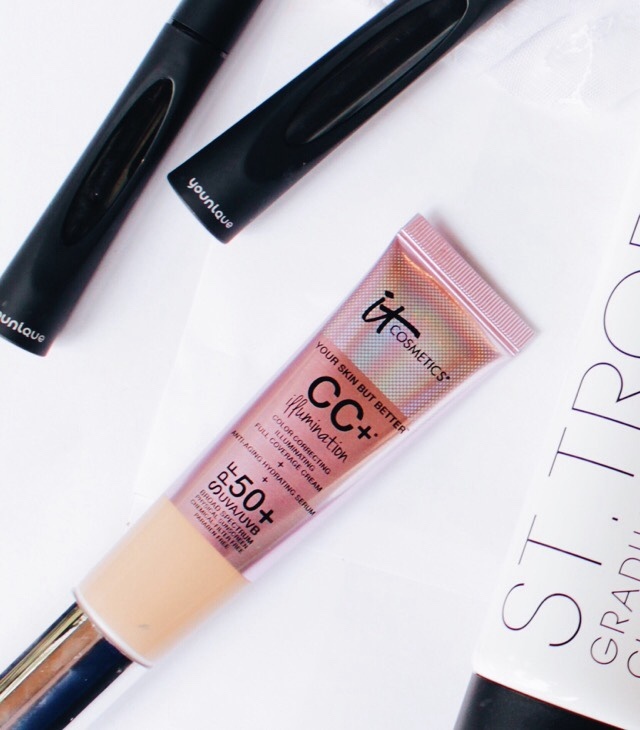 1- St Tropez Gradual Tanner - I've been using this gradual tanner for almost 2 weeks now and it's amazing. I actually love the smell, it's not sticky, it soaks in fast and makes your skin feel nice and soft! I am fair skinned and I got the medium/dark shade and it has worked perfectly. It's a nice gradual tan like you would expect but I saw results after the first use. I hate those ones that you have to use for months before you might think you see anything! I put it allover from my bust down (I like having a lighter chest, neck and face and I hate having to get darker make up!) after I shower and use it about 3-4 times a week. I took a before picture of my legs and stomach and when I leave for the Bahamas next month I'll take an after photo and see how well it worked over the whole 6 weeks. 2- M.A.C. Strobe Cream (above photo, center) - This moisturizing cream is amazing. 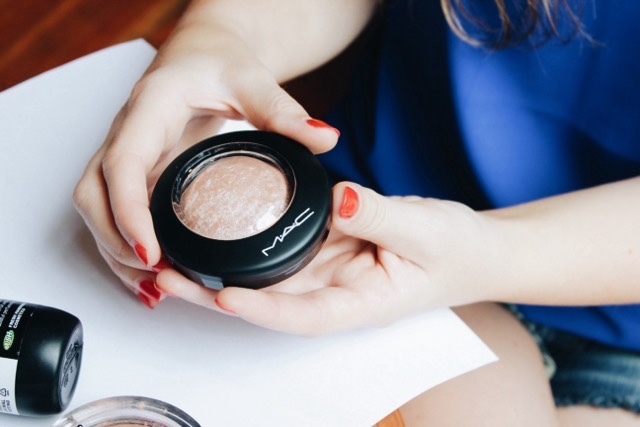 It has a pearly finish to it so it illuminates your whole face and gives you that hydrated dewy look we all love. If you don't want to do a full face of make up on your travels this with a little bronzer and mascara is all you need. I got the 1 ounce travel size for $10 and it will probably last me a good 4 months and at that price how can you say no?! 3- M.A.C Mineralize Skin Finish - This people, thiiiiisssss. 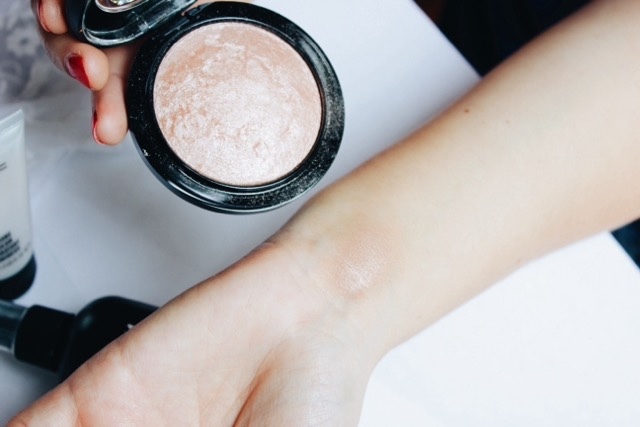 This is everything when it comes to highlight. I put this above my cheek bones and on my cupids bow and it just makes your eyes and lips pop! 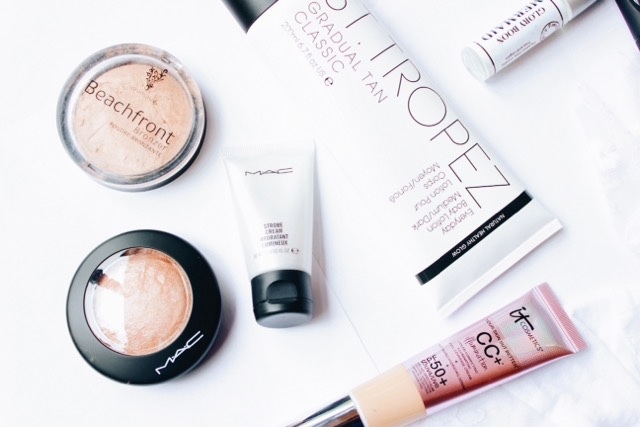 This really helps brighten up your face whether you're wearing other makeup or not. I have it in shade 'soft & gentle' and it comes in lots of shades so it will look perfect on your skin. 4- Lush Cosmetics Sea Spray - All these makeup items we can't forget about hair! This is a great no muss no fuss salt spray that smells fantastic and has a bit of gel in it so it works great for taming fly-aways, adding body, or helping your hair dry smooth after a dip in the ocean. It's an all-in-one miracle so it's great for travel because you won't need 3 different products. 5- It Cosmetics CC+ Illumination Cream - I got this CC cream because it's been all the rage lately and I thought it would be perfect for vacation with the illuminating factor and high SPF. I've been using it for about 2 weeks now and I love the coverage (it's legit full coverage and I only use half a pump! 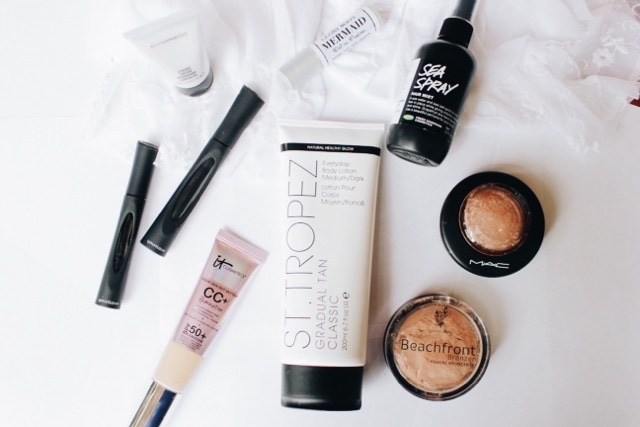 ), the SPF protection, and how amazing my skin feels when I take it off! I didn't notice a lot of illumination, but with items #2 & 3 that's a non issue, and it has a yellow tone to it vs pink which isn't my personal fav (this might be perfect for some of you though!) but I still love this CC cream. 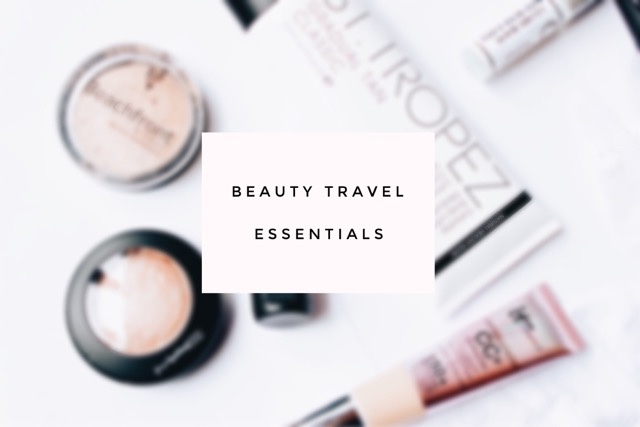 Definitely a must for beauty travel essentials. 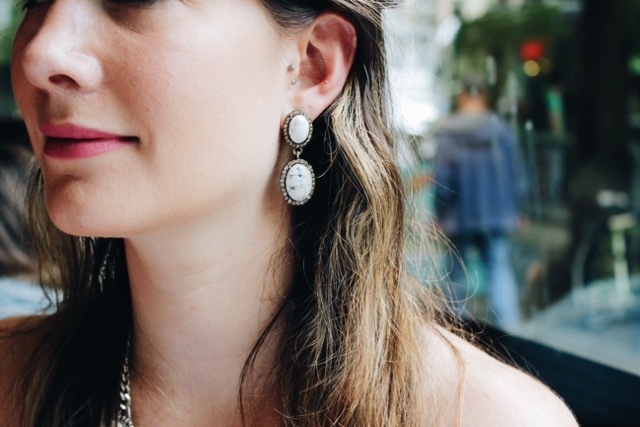 Some of Rachel's other travel favorites are these shoes and these earrings. Whenever traveling, you should always pack a pair of versatile sandals or shoes, and a little jewelry to add some detail. A Little Bit of Sun-kissed with Younique's Beachfront Bronzer. 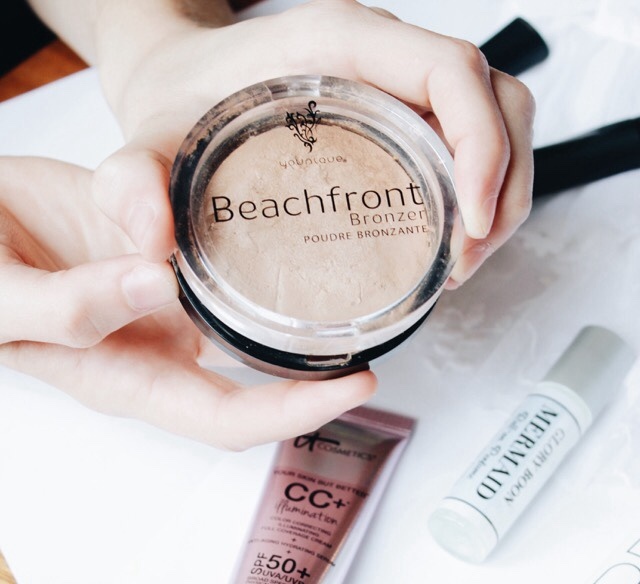 This beautiful, glowy, facial bronzer is so pretty and it is a great essential to have when traveling. 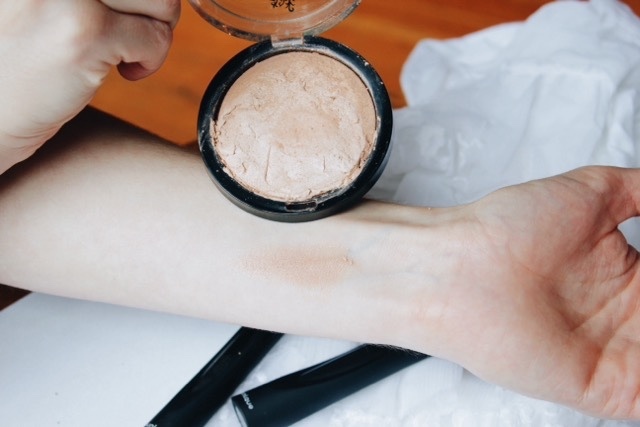 We all want light makeup while traveling, and this bronzer compact can do so many things for you. It can be a light powder to start your tan off right, you can use it as blusher, for contour, or even as a little bit of eye shadow. It is such a pretty bronzer, and it is one of my favorite, all time makeup items. It even has a little bit of shimmer and glow to make you look like a sun goddess. For about a year now, I have been searching for natural perfumes to replace the ones that have harsh chemicals. Well, I found one on this darling Etsy shop, and ladies, it is perfect for air travel. Yes! This TSA approved, little roller bottle can fit in a clear cosmetics bag that security can easily look at. Not only does it have that perk, but it also has this beautiful, dreamy fragrance. It is made with all natural essential oils, and fractionated coconut oil, so there is nothing in this perfume that will disturb any hormonal functions. Love that! Also, it smells so fresh, and so beachy. It smells like fallen rain, and glistening waters. This perfume is such a great find, and so perfect for traveling. It can even fit in your purse for everyday errands. This mascara has become Rachel's and my favorite! I have been using this mascara exclusively for just about a year now, it makes my lashes thicker, longer, and far more visible. 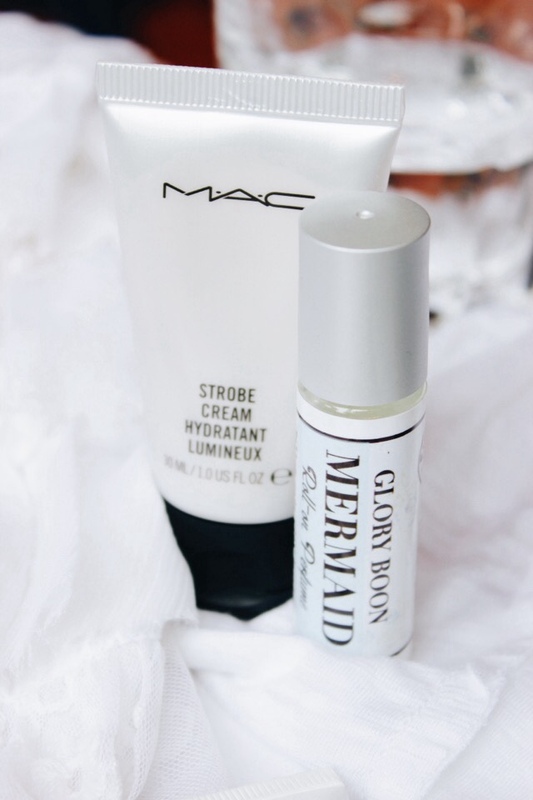 It is so easy to use, and it will be a fast addition to your travel makeup bag. The sleek packaging of this mascara makes it classy, and can easily fit into a TSA clear cosmetics bag, or even your purse! As you apply it, you will see your lashes become thicker, and longer. 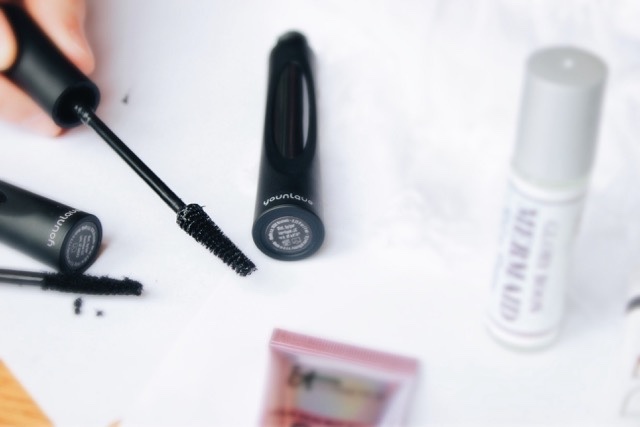 First, you put the transplanting gel on your lashes just like regular mascara; you then apply the fibers, and then seal them again with the transplanting gel. You will immediately see a positive difference in your lashes. It was so much fun working with Rachel from One Pot Slop. I have never worked with another blogger before, and I enjoyed it! We worked together on the pictures, the lay outs, and talked about the different camera angles. I think working together with another blogger is extremely fun, and it creates such pretty posts.